We've partnered with Dublin Theatre Festival to give you two free tickets to 'The End of Eddy' plus free brunch at Cleaver East. Competitions 2 October, 2018 . Written by Sarah McKenna Barry. Dublin Theatre Festival and GCN are offering you the chance to win a pair of tickets to The End of Eddy at the Project Arts Centre, as well as a complimentary pre-show dinner at Cleaver East. The End of Eddy, which has received critical acclaim from The Guardian, The List, and The Scotsman, makes its Irish debut at the Dublin Theatre Festival. 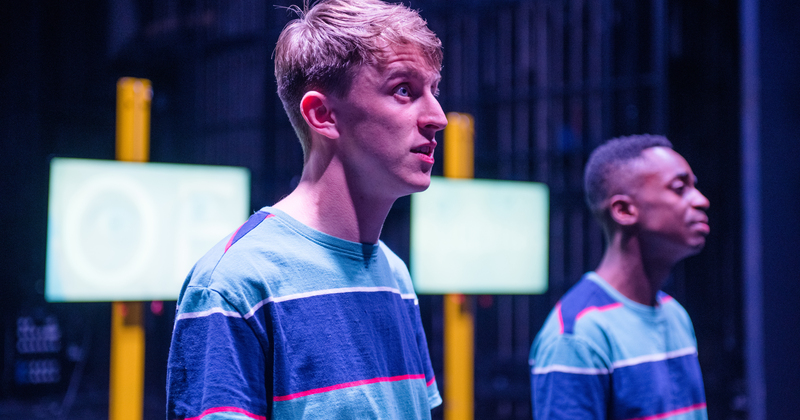 Presented by The Unicorn Theatre London and United Projects, the play follows the story of Eddy, born into poverty in an isolated French town, as he navigates homophobic bullying, violence and his own sexuality. The End of Eddy is based on Édouard Louis’ En Finir avec Eddy Bellegueule. This acclaimed autobiographical novel of hope, love, lust and anger, and has been described as both unflinchingly honest and hugely entertaining. The novel was adapted for theatre and focuses on Eddy’s struggle to understand who he is, who he might become, and of his flight to escape. This new stage adaptation is a co-production from the UK’s leading theatre for young audiences reunites visionary director and designer Stewart Laing with writer Pamela Carter whose Paul Bright’s Confessions of a Justified Sinner was at Dublin Theatre Festival 2014. Cast members Alex Austin and Kwaku Mills have both received acclaim for their performances. The List praised the actors for taking their audience to the “heart of adolescent confusion and longing”, and for putting “poverty and violence so succinctly in context” without a shred of sentimentality. The End of Eddy opens on October 9 in the Space Upstairs at The Project Arts Centre. The show runs until October 13, with 2:30 pm matinees on October 11, 12 and 13. Cleaver East is the perfect restaurant to enjoy a pre-show brunch or dinner, as it offers the very best in Irish and European cuisine with an emphasis on high quality, locally sourced cuisine. To be in with the chance of winning two tickets to the matinee (2.30pm) on October 13, as well as a complimentary 2 course brunch plus mimosa/bellini at Cleaver East simply answer the question below. 2 October, 2018 . Written by Sarah McKenna Barry.